Storytelling + Research = LoiS: Trugg says 2018 is here! We're solidly into the New Year, but Saturday, January 6 is the 12th Day of Christmas or Epiphany. 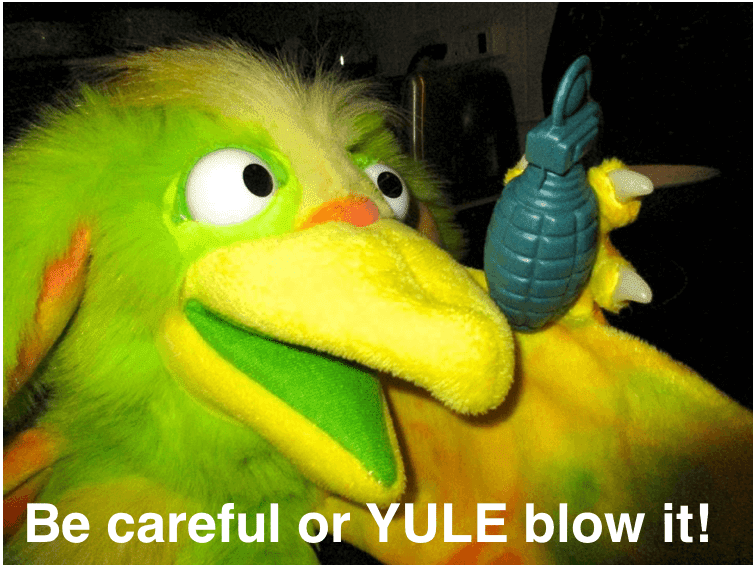 My puppeteer colleague, David Quesal, and his "monster", Trugg, send this message. For some enjoyable videos of David and his Puppet Troupe, check out his YouTube videos. I especially loved his fairy tale mash-up, A Fairy Tale of Errors, and gladly would recommend it to groups looking at ways to creatively use several folk tales to create a new story. Just as with "Fractured Fairy Tales" it's important to know the original. In this case it could be considered a look at what might happen after the tale ends or "and they all lived happily ever after...NOT!" Whether intended or not, David follows the same sort of "down the garden path" in the musical "Into the Woods." I'm looking at a rapidly filling "dance card" of commitments, including a local residency with an adult special education class creating a puppet show and video version of Snow White. Since the aim of the production is performance for preschool classes, it will be interesting to see how the group chooses to balance the original story's repeated efforts by the queen to kill Snow White and also its ending with a rather gruesome execution of her with Bruno Bettelheim's view of the necessity to recognize such evil exists and the need to show justice when it is punished. Just as with this past year's Young Writers program, it will be in the hands of the students and they create their version of the story. The fact that those young writers only created as much as they could handle was part of the solution with another grisly Grimm tale. That Bettelheim label takes you to, among other posts, my earlier consideration of how to approach it. Interestingly enough two Caldecott award Honor books each chose to include the traditional ending. You may choose to look for yourself at the 1938 book by author/illustrator, Wanda Ga'g, known for her accurate translations of Grimm. 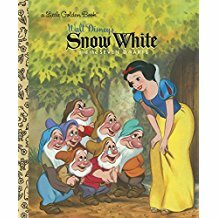 Wikipedia offers a very brief article saying she was approached to do a version more faithful to the original after the success of the 1937 Disney film. The book's critical reception focused on the visual way Ga'g handled it, but that is precisely the focus for Caldecott awards as long as the book is considered worthy. Also worth noting, prior to 1971 an Honor book was called a "runner-up", with all previous books in that category changed to the new term. 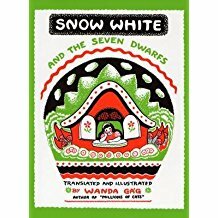 If you dismiss that book as coming from an earlier time, look at the 1972 version translated by poet and author, Randall Jarrell , who also translated a few other Grimm tales. It, too, retains those same elements possibly considered too mature or troublesome. This version won the Caldecott Honor award for illustrator, Nancy Ekholm Burkert. 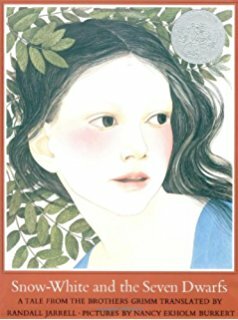 While Caldecott awards require a text of merit, the award goes to the illustrator (although it never hurts the book's sales for its status). This is her most celebrated work, but she has won more recently the Boston Globe-Horn Book award for Valentine and Orson and was recognized by the Wisconsin Library Association as a Wisconsin Notable Author. She will be 95 in mid-February, so this will probably remain her best known work although not all she illustrated. It's worth prowling reviews, even the positive ones, to notice how some view the ages able to handle the queen and also her ending. Over all of this lurks the 1937 Disney version. No less than the Library of Congress cites its value as "culturally, historically, or aesthetically significant" when placing it into the National Film Registry and it's among the American Film Institute's 100 greatest American films, going even further by naming it the greatest American animated film of all time (2008). Whether we like Disneyfication of literature or not, it is a fact that this first feature length film by the Disney Studios has influenced how the story is viewed. The dwarfs are not named nor all given personalities in the original tale. Their comic value is important to the film's tone although a lot of the suggested gags, while developing the movie, were dropped. Disney even paid $5 per suggested gag in that early stage. Reading the previously mentioned Wikipedia article shows the same type of planning the students will need to consider. They will be seeing the film. Much as I personally love the movie's songs, we'll not be tempted to use them because of copyright royalties. The movie was a critical and long-time economic success. Beyond that, I think the Library of Congress is correct in considering it of significant value to our culture. Growing up with Little Golden books, here's their children's book using the film version. I think it's safe to say that almost every American grew up with this version of the story and a great many haven't a clue that the original story is so dark. Now the trick is to gauge how much of the original is appropriate to a preschooler or, possibly more importantly, a preschooler's parent...remember those review comments mentioned in the Jarrell/Burkert edition. We should have our script ready by National Tell a Fairy Tale Day and working on puppet, scenery, and prop creation. This year's NTaFT day falls on a Monday, since February 26 is the celebration date. Mondays are when this group will work on their production. I hope they also choose to celebrate Fairy Tales and grow from this project.